According to Bruce Heald in his 2002 book Around Squam Lake, published by Arcadia Publishing, "... this grand farm proudly stands as a landmark on the shore of Lake Winnipesaukee. 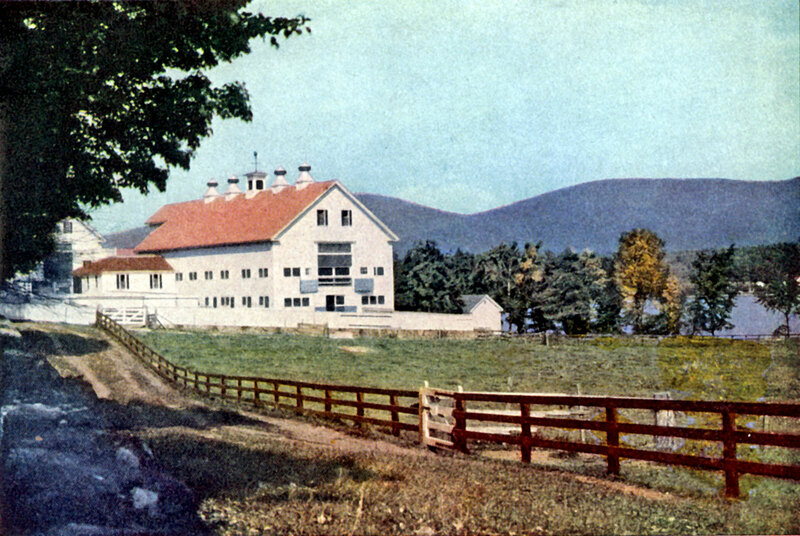 Ernest B. Dane and family came to Center Harbor from Brookline, Massachusetts, and purchased most of the farms that came on the market during World War I, thus preserving Center Harbor country village. 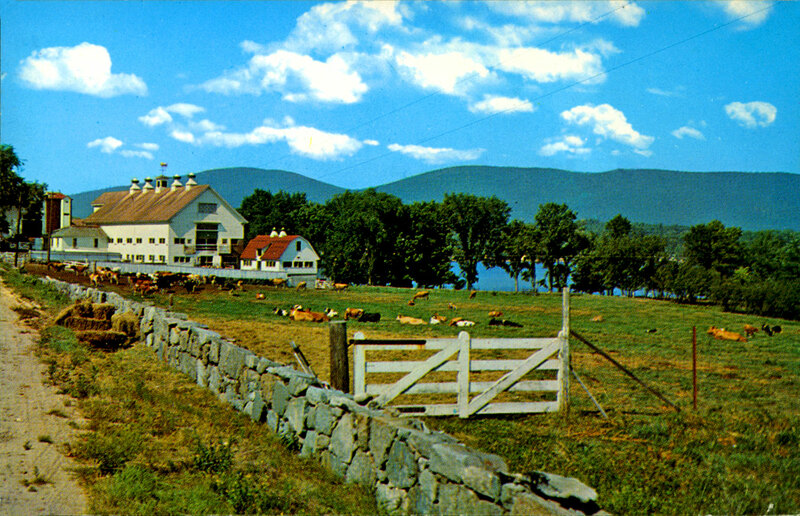 The Dane farm included many acres bordering Lake Winnipesaukee and was known as the Longwood Farm. The farm supplied feed for the prize Guernsey cattle in this barn." The caption on this particular postcard read "Longwood Dairy Farm". Unfortunately, the farm's lakefront land was too valuable to preserve for farming, so the farm no longer exists. Just before reaching Center Harbor on Route 25 from Meredith, one sees on the right that the former farm land is now the site of several elaborate private homes. Here is a similar view, a clipping from an article in National Geographic Magazine of the late 1930's titled "New England's Wonderland of Mountain, Lake and Seascape". The caption on the photo said "Quarters for Blooded Stock on Lake Winnipesaukee". 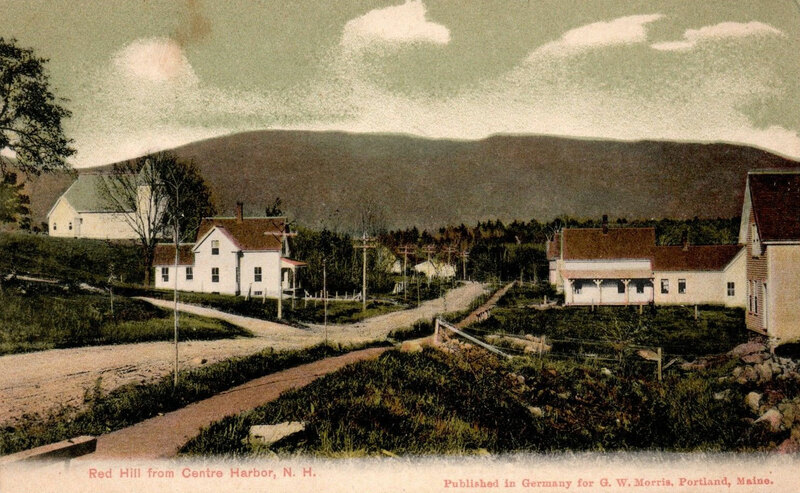 A very old postcard of Red Hill from Center Harbor. What is now the main highway (Route 25) was just a simple dirt road at the time. 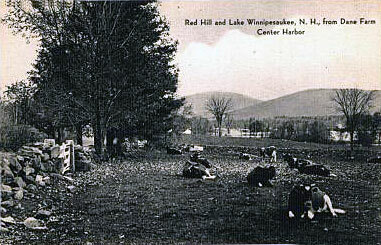 Here is a very old postcard showing another view of Red Hill from the farm.